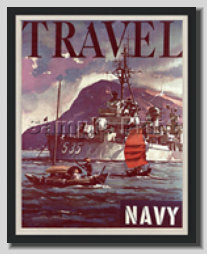 This reproduction print depicts a great vintage recruiting poster from around the late 1950's. Published by the Navy Recruiting Aid's Facility. It features a painting by Lou Nolan depicting USS Miller (DD-535) visiting a far Eastern port.